I'd like to return this quality item, please. 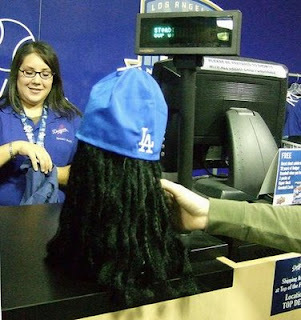 For sale: 2,000 Manny Ramirez wigs. As the LA Dodgers have found out - painfully - basing an entire marketing strategy on a famous person is a dangerous thing. When Ramirez got suspended from the Dodgers last week for taking steroids, he royally screwed over the team, its fans, and himself - but mostly, he screwed over the marketing and PR departments. This would normally be bad news, but for the most passive marketing department in history, which - according to the NY Times - plans to do "nothing." Swell. They've already sold 1,800 of the $25 Manny Ramirez wigs (see photo, above), 850 of Ramirez jerseys, and 5,000 T-shirts. Three-for-one sale, anyone? They named a section down the left-field line at Dodger Stadium "Mannywood." Out-of-home treatments across LA say, “Manny’s Back." There's a Ramirez bobblehead promotion in the pipeline - which is apparently still a "go" for July, when his 50-game suspension is over. The Dodgers sold 30,000 tickets the day after Ramirez was signed; now that he's suspended, could these fans claim "bait and switch?" What's more frightening is that, as the Times reports, the Dodgers think the mess will go away, "mostly by doing nothing at all." Sigh. As we learn in PR class every year, the Ostrich Strategy doesn't work: "A PR crisis won't go away if you ignore it." "It doesn't happen very often, but celebrities have a way of turning up in hotel rooms with persons of questionable character, doubtful employment, and large Ziploc bags of "Peruvian Marching Powder" tucked into their orange vinyl boots." "Are you willing to bet a client's financial future that your superstar won't end up manufacturing license plates?"